Description: Here's what the talus slopes look like when finished. They're made out of real shale chips, collected from our driveway and sifted through a strainer we got at the local grocery store. We put the big pieces down first and secured them in place with dilute white glue. (Matte medium thinned with rubbing alcohol also works well.) 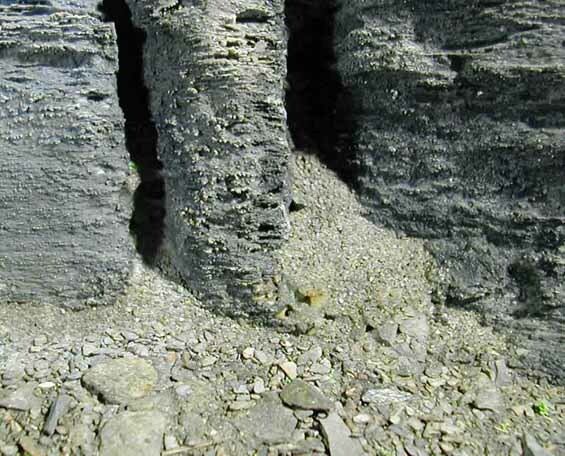 Once the first coat was thoroughly dry, fine-grained shale chips were brushed into place, taking care to work them down into the gaps between the bigger chips. Then this layer was secured with the same dilute glue solution.